Tourists to the Churchill Wildlife Management Area in the Hudson Bay region of Manitoba stop and get a close up view of a Polar Bear. Vehicles pull over and stop to admire a beautiful polar bearwandering along the roadway in front of them in the Churchill Wildlife Management Area in Manitoba, Canada. 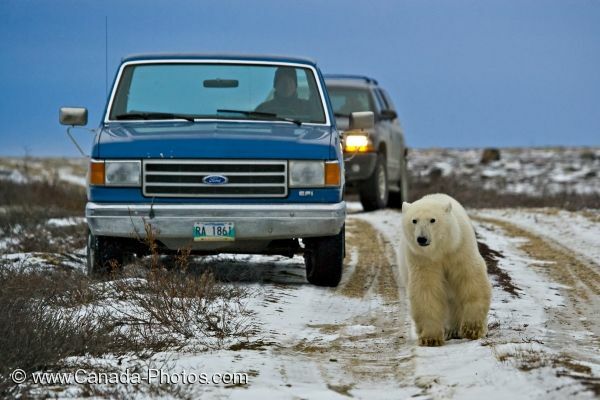 The Polar Bear does not seem to worried about the vehicles and continues on his journey in search of a good meal. Polar Bear, Ursus maritimus, crossing a road in the Churchill Wildlife Management Area in front of tourists, Hudson Bay, Churchill, Manitoba, Canada. Picture of a Polar Bear in the Churchill Wildlife Management Area near the Hudson Bay in Manitoba with tourists close behind.